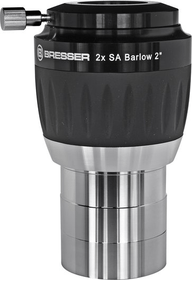 Named after its inventor, the English mathematician and physicist Peter Barlow, the Barlow lens is a diverging (negative) lens, which is used to increase the effective focal length. This results in a higher magnification. 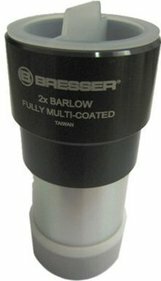 Moreover, the Barlow lens is very easy to use as the Barlow lens can be placed directly in front of the eyepiece. 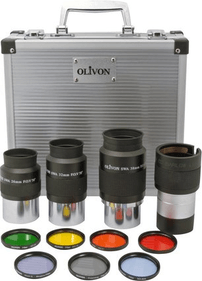 Imagine you use a 10mm eyepiece with the focal point of your telescope being 1000mm. Now you have a standard magnification of 100x. With a 3x Barlow lens you will arrive at magnification of 300 x! This is a cost-effective way to achieve a better result. An additional advantage is the ‘flatter’ and sharper image produced by the Barlow lens. 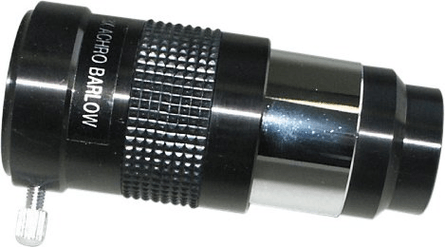 A minor drawback is the small optic angle inherent in higher magnifications.